Every contractor should know the rules outlined below, as well as any other local, state, and federal regulations applicable to their line of work. For neighbors who have questions or would like to report construction-related code violations, please contact 311. Most construction projects require building permits. To see a list of what does not require permits, go to Section 130.3 "Exempted Work" of the Denver Building & Fire Code (PDF). Construction noise is allowed between 7 a.m. and 9 p.m. on weekdays and 8 a.m. to 5 p.m. on weekends. Finished projects may change the acoustic environment but must still comply with Denver’s Noise Ordinance. Noise violations often result from operation or improper placement of HVAC units, generators, and loading docks. Contractors must take reasonable measures to prevent particulate matter from becoming airborne and to prevent the visible discharge of dust and other particles beyond the property where they originated. The measures must be effective on the site at all times, including periods of inactivity such as evenings, weekends, and holidays. Dirt and debris may not be placed in streets, alleys, sidewalks, or city dumpsters. Building permits must be posted onsite and be visible from the street. Contractors must have a way to control water runoff and erosion, and adjacent properties must be protected from damage, including foundations, fences, and landscaping. Each job site is required to have a port-o-let or other sanitary facility for workers. Store equipment and materials in a safe manner for workers, the public, and adjoining properties. If a project involves demolition or excavation, the permit applicant must notify the owners of adjacent properties before obtaining demolition/excavation permits. Any open excavation site (including digging out a basement) or other hazardous job site must be surrounded by a 6-foot fence to prevent unauthorized access. Obtain a right-of-way (ROW) permit from Public Works before placing a container or dumpster in the street or otherwise blocking a street or alley. 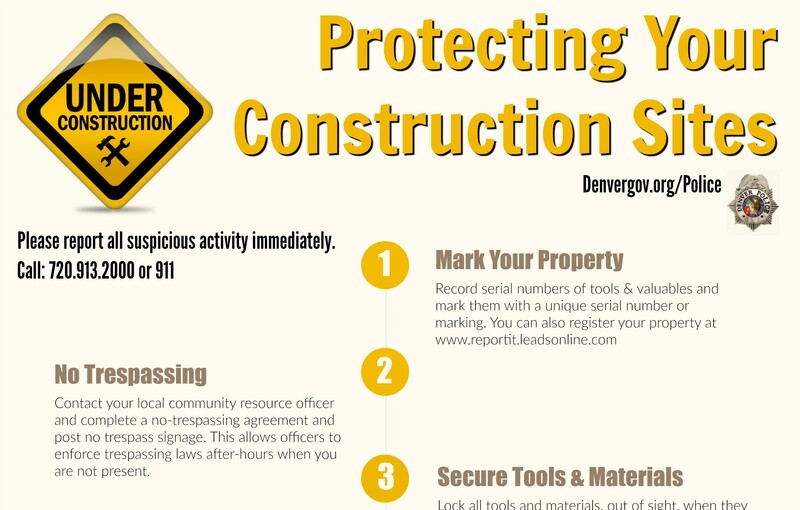 The Denver Police Department is reminding contractors to protect their job sites from construction-related theft. Protect your site and materials around the clock. 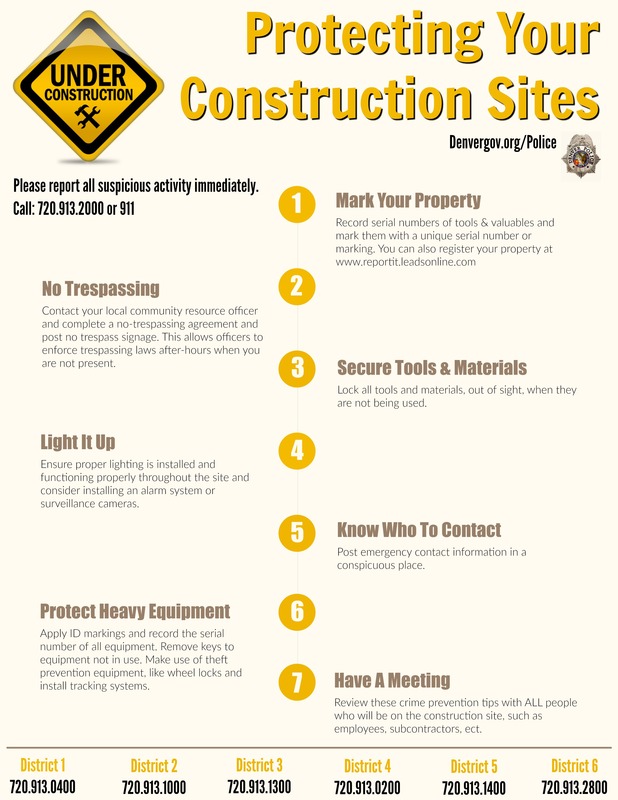 Secure all windows, doors, and construction gates/entrances when you leave the site, write down the serial numbers of equipment and tools, and consider cameras, lights, and other deterrents. For more tips or phone numbers for your police district, download DPD's flyer (PDF) or visit DenverGov.org/Police. Renovating or demolishing existing structures may disturb materials that contain asbestos or lead-based paint. Both asbestos or lead-based paint must be managed in accordance with federal, state, and local regulations. Radon is a naturally occurring radioactive gas and a leading cause of lung cancer. Most of Colorado, including Denver, is in Radon Zone 1 which has the highest level of radon risk. While the City and County of Denver does not require radon testing, the U.S. EPA recommends installing a mitigation system if a home exceeds four picocuries per liter (4 pCi/L) of radon gas and using radon-resistant construction techniques in new structures.